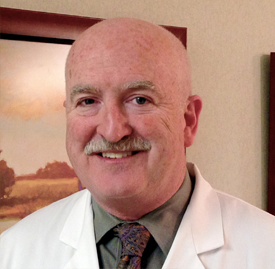 Dr. Muldoon is a graduate of the United States Naval Academy and the Uniformed Services, University of the Health Sciences. Dr. Muldoon completed his residency in Orthopaedic Surgery at the Naval Medical Center, San Diego. He went on to complete a fellowship in Adult Reconstructive Surgery at the Mayo Clinic in Rochester, Minnesota. At the Naval Medical Center, San Diego, Dr Muldoon was the Director of the Hip and Knee Service for 7 years and served as the Assistant Chairman of the Department of Orthopaedics. Dr. Muldoon has extensive experience in hip, knee and shoulder replacement surgery as well as complex hip and knee revisions. His particular area of expertise is arthroscopic hip surgery for traumatic and degenerative conditions. Dr. Muldoon has a special interest in hip and knee problems in young active patients. Dr. Muldoon has published numerous papers on reconstructive surgery and continues to be active in research and teaching at Orthopedic Medical Group.